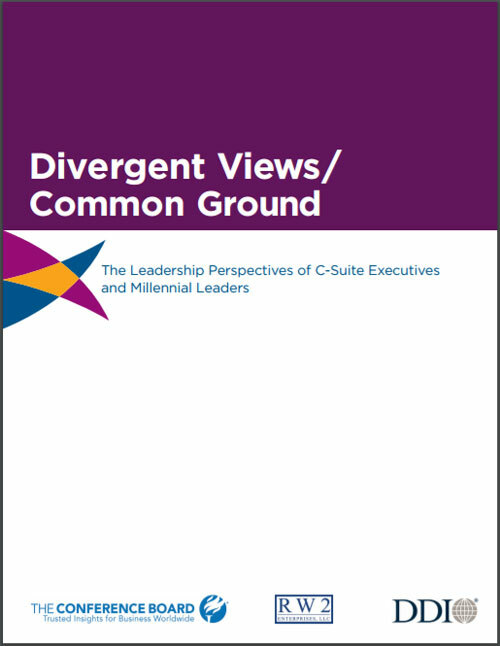 Divergent Views/Common Ground: The Leadership Perspectives of C-Suite Executives and Millennial Leaders comes in the wake of an extensive, ongoing departure of Baby Boomers from the U.S. workforce. With each passing day, Millennial leaders now assume an increasing role in steering both the nation’s economy and the organizations that comprise it. Yet the subject of their leadership lacks adequate research, with widespread assumptions painting an often inaccurate picture. As such, this research sheds light on their leadership values and preferences; where they agree with and differ from other leadership cohorts and generations; and in light of the findings, what steps organizations can take for enhanced performance. "Leaders will need to navigate very ambiguous terrain, to see a new ecosystem. The pace of change will get faster–hard to predict and mode–this will be disquieting for most." Submit the form to receive your complimentary research. For additional information about the report, please contact Rebecca L Ray, Ph.D. at rebecca.ray@conference-board.org. For any additional assistance, please contact our customer service team. We are here to assist you. © 2017 The Conference Board, Inc. All rights reserved.